Im looking to to get one but would like to know what someone who has one thinks. a friend has one. It is utterly uselss, but fun as hell! I agree with the "utterly useless and fun" comment. A very cool little toy. Dont shoot it much but when I do it is a hoot.. I almost bought one today. Decided to take a walk around the gunshow to make sure it wasn't a completely random impulse. Decied it was a completely useless toy that I should own, went back to the C3 dealer and it had already been sold. Excellent vehicle weapon to take with you on road trips. I went with the Mossberg version, as I like the up top safety. 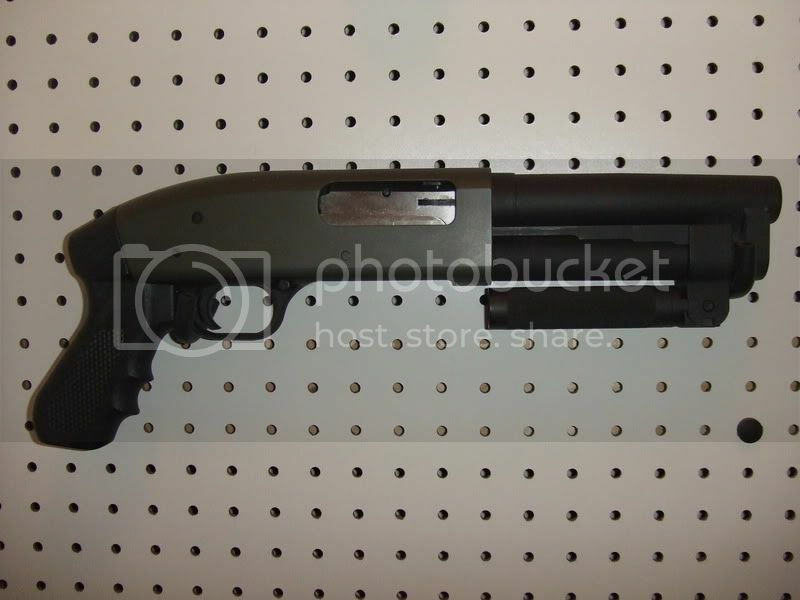 Plus, I have a full size Mossberg 500 pump to go with the Serbu. Anyway, the only accessories I added were the Hoge Tamer Grip and the Scope rail, which I may or may not keep on her. I guess I could always slap on a red dit site or tac light. How does that Hogue grip do with recoil?? Does it tame it down any or is it just more comfortable?? The grip a tad thicker and WAY more comfortable that the hard plastic factory stock. I got one for my full size Mossberg pistol Grip as well. I find the baby shottie fun to shoot for a 25-round box of shells. I only wish theyd come up with a 1/2 shell version. fully dedicated to the Aquila 1/2 shells. One hell of a home defense piece. Think about paying the extra $195 in tax $ and getting it as a SBS. With a short stock it's my first choice for bear defense in Alaska while canoeing or backpacking in 'lower risk' areas. It's a good compromise between power and size when freedom of movement is required. The mag capacity is low but a little practice with bolted on side saddles takes care of that for me. I agree I would like one as an SBS. It looks like a mighty fun toy.